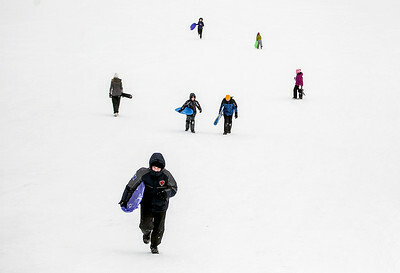 Sarah Nader- snader@shawmedia.com Kids pack the hill at Ted Spella Community Park in Algonquin, sliding down on sleds and climbing back up for another run down Thursday, December 26, 2013. Sarah Nader- snader@shawmedia.com Skyler Davison, 10, of Lake in the Hills crosses the money bars while playing at Ted Spella Community Park in Algonquin after sledding with his family Thursday, December 26, 2013. 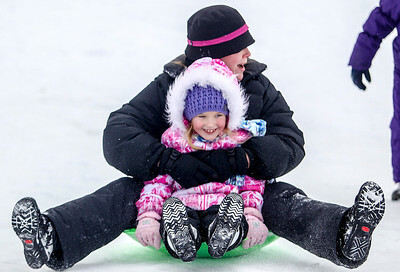 Sarah Nader- snader@shawmedia.com Colleen Nolan of Lake in the Hills holds her daughter, Lexa, 7, as they slide down the hill at Ted Spella Community Park in Algonquin Thursday, December 26, 2013. 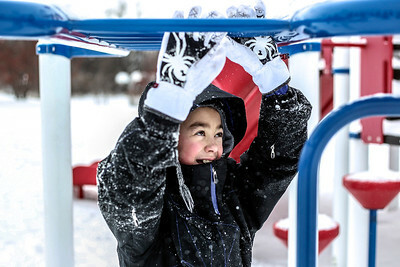 Skyler Davison, 10, of Lake in the Hills crosses the money bars while playing at Ted Spella Community Park in Algonquin after sledding with his family Thursday, December 26, 2013.